History: Brought up just outside Bath in Somerset, England in a family of doctors, I left school at 17 and worked in various Relais & Chateau hotels throughout Britain, including Longueville Manor, Jersey and Hunstrete House, Somerset. I then moved to The Royal Crescent Hotel in Bath, where I worked my way up to senior sous chef. I then moved to Les Bories, Gordes en Provence, as head chef, where I obtained my first Michelin star at the age of 23. I moved back to Britain and worked at Hambleton Hall, a Michelin starred restaurant in Oakham, as senior sous chef. I then took my first head chef job in Britain at Calcot Manor, Tetbury, where they had a Michelin star already, and I was able to retain it the time that I was there. I was then asked if I would work for Sir Bernard Ashley (Laura Ashley’s widower) at Llangoed Hall in Wales. He had always wanted a Michelin star for the hotel and I achieved that for him within the year, and retained it for the time I was at the Hall. While there I was lucky enough to be asked to cook for the G8 summit of world leaders, among many other noteworthy names; I was also the group executive chef for Sir Bernard's hotels in the USA. 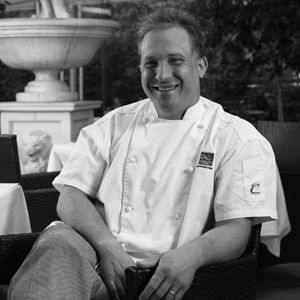 I then moved to Ettington Park Hotel, Stratford-upon-Avon, and then to Australia in 2006, and have been the executive chef at Monty's Restaurant at the Quality Hotel Powerhouse in Tamworth since then. Yes, since I was very young. My mother's father was a chef before World War II, and my mother had a restaurant in Bath in the 1970s and 80s which I used to help her with when I was young. All my siblings and both my parents are great cooks, so even though they are all medical, we all have a shared love of food. The food I cook is very much defined by the area I am working in and the season it is at the time. I think that nowadays it is too easy to buy produce from any corner of the world and use it because of its status as a luxury food item (such as truffles and foie gras), which certainly doesn't say 'Australian produce'. You should use the best produce and treat it with the respect it deserves. Whatever local producers bring at the time, but I love really good herbs, my favourite of all time (pardon the pun) being thyme. Local produce and the survival of local producers, who are being crippled by the large supermarket chains. I think all the great chefs I have worked for, but mainly people like Franco and Ann Taruschio of the Walnut Tree Inn and Shaun Hill, who have been leaders in the field of fine cooking without ever having to ply their trades in established food hubs, such as London or - in Australia - Melbourne. They proved that you can work regionally and still be as good as anything that is produced in the recognised food destinations. No two days are ever the same and even though I have been cooking for nigh on 30 years, I have only scrached the surface of what there is to learn about food. You never stop learning! I was once served roast calf's liver with a passionfruit sauce by a commis chef trying to impress me. That was more than 20 years ago and it still haunts me to this day.